Pepper Construction is a Chicago-based construction company. For 90 years, they have worked throughout the Midwest to deliver construction services for all types of projects. 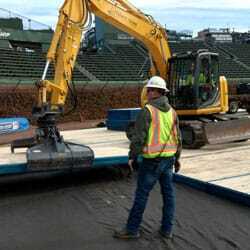 For two years in a row, Pepper Construction asked Sterling to provide a ground protection solution for a MLB baseball field during the reconstruction of the stadium. 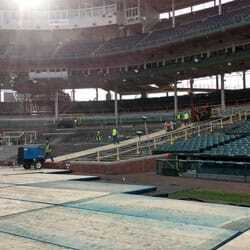 Pepper Construction undertook a major stadium renovation that had to be fully completed during the off season. 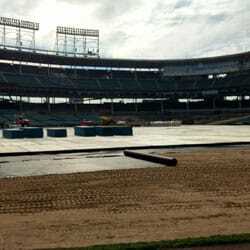 Throughout the demolition of the old structure and building of the new structure, heavy equipment would be used — and the ground crew wanted to protect the integrity of the field by maintaining a strict PSI limit. 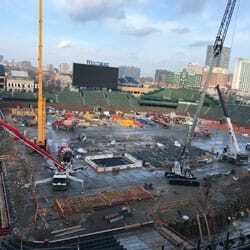 Sterling and Midwest Access Solutions were engaged to understand the engineering needs and develop a site access plan that could help Pepper use the necessary equipment while protecting the baseball field in time for Opening Day. 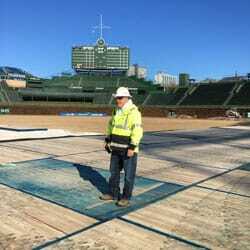 A third-party engineer was employed by Sterling to certify the desired grounds crew specifications were met. In addition, working throughout the winter posed potential weather challenges. The smooth surface of TerraLam® mats allowed easy cleaning of the platform with a street sweeper. When snowy conditions occurred, the snow was easily removed and buildup of ice and snow was never an issue. Once Sterling understood the requirements, they set out to develop a matting solution that would be the most cost-effective option. The result was creating a custom mat made out of TerraLam matting technology. Sterling built 900 custom TerraLam 500 series mats that were laid out over a two-day period. The solid top of the mats created a dance floor-like smooth surface to allow the crews to move around safely. Geofabric was used underneath the matting to capture any construction debris that could fall between the seams of the matting platform. Because each mat covered 128 square feet of field, Sterling greatly reduced the number of seams versus alternative products. The project finished on time both years, and the team took the field Opening Day without knowing Sterling was ever there.